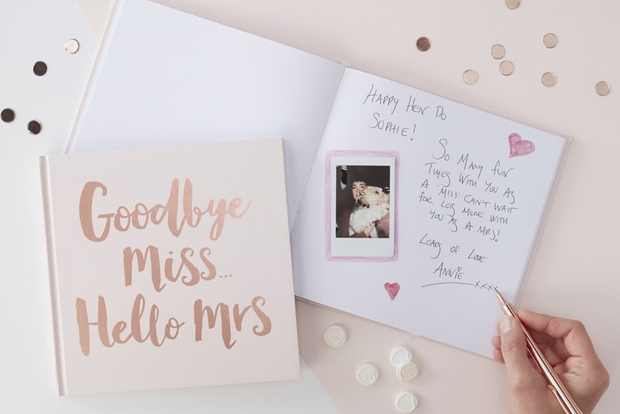 It’s the little touches that will really add to and personalise your Big Day from a cute sign for the flower girl to wave as she makes her way up the aisle to pretty robes for you and the girls to get ready in and a beautiful guest book to capture lots of lovely sentiments. And you don’t have to go far to find some amazing pieces to really set your day apart – today we’re sharing 12 great Irish and online stores that stock everything from pressies for the bridal party to accessories for the hen. Happy Shopping! 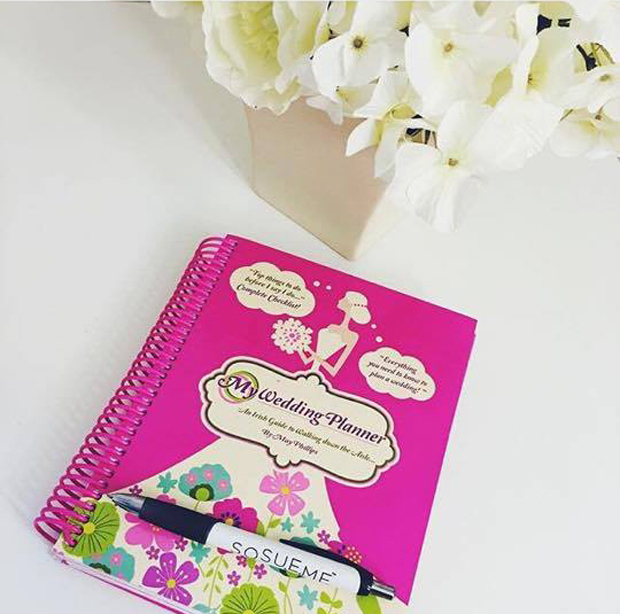 No wedding journey is complete without a planner to keep you on top of things. 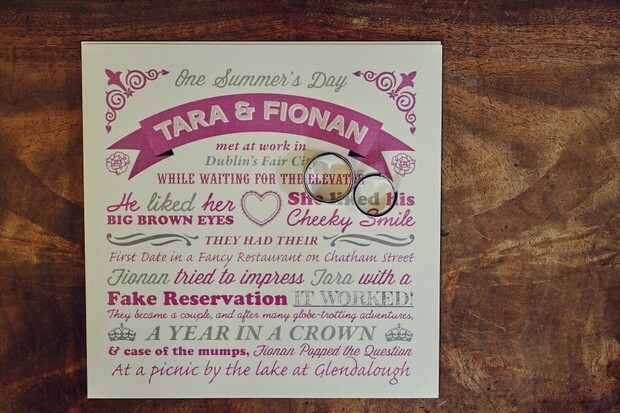 And it doesn’t get much better than this pretty planner designed especially for Irish brides from MyWeddingPlanner.ie. It takes you through each step of your planning journey with a complete to-do list plus handy tips and tricks. It’s also the perfect keepsake – something you can look back on when it’s all over! You can pick up a journal for €17.95 plus p&p on MyWeddingPlanner.ie. This haven of bridal goodies stocks everything from wedding dresses and bridesmaid dresses to shoes, accessories and some fab finds on the decor front. 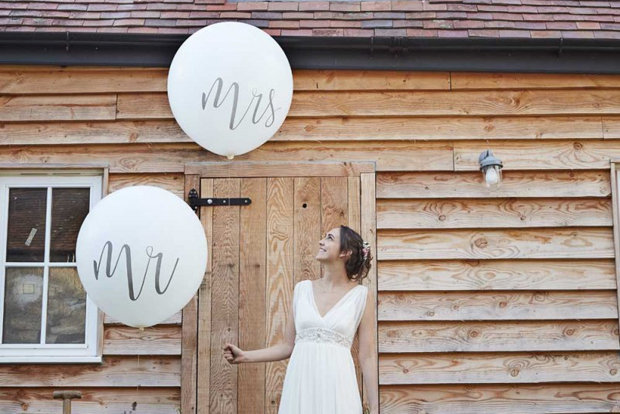 Pearls & Lace Bridal Boutique have everything you need to make your ceremony and reception extra special from cute signs and ring dishes to guest books, pom poms, balloons, confetti, ribbon and photo booth props. They also have a fab range of hen party accessories if you’re after some fun buys for the Big night! You can shop online or pop in to their Dongeal store. If you’re looking for supplies to make the hen party super special, head right over to Irish online store Henworld.ie. It’s jammed full of hen goodies from sashes and personalised tees to badges, tiaras, temporary tattoos, inflatables, games, gifts for the lady of the moment and even costumes. They’ve also got some awesome decor if you fancy sprucing up the hotel room or house including signs, confetti, napkins, balloons – the works! Another mecca for Hen Parties, JokeShop.ie has lots of fun accessories for your hen or stag whether you’re looking for some cheeky or funny additions to the night or want to keep things classy with some cute tiaras and personalised tees. They also specialise in costumes if you and the girls are going with a bit of a theme. You can shop from the comfort of your couch or if you’re in the Athlone area, you can stop by their store for a browse too. 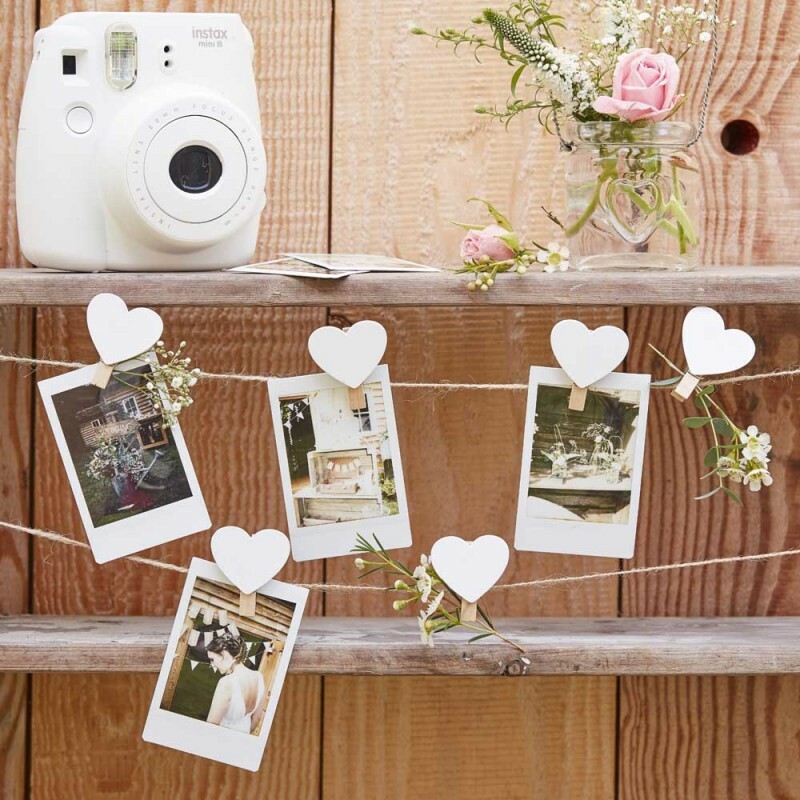 If you’re after some gorgeous gifts for the girls or some cute pieces to make the wedding morning even more memorable, be sure to pop over to Pretty Little Ideas. 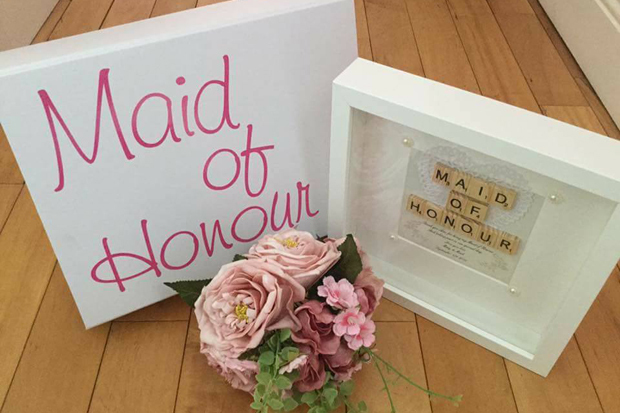 Their online store is full of fab personalised buys from personalised boxed frames for the bridal party and the Mother of the Bride/Groom to groom gift boxes and tags, bride and bridal gift boxes (a gorgeous keepsake! ), cute signs, freestanding wooden letters, bridesmaids cards and much more. They also rent out a sweet cart and can supply Crisp Sambo kits! Congratulations.ie are your go-to store for beautiful stationery and accessories! Whether you’re after some lovely finishing touches for your invites such as envelope seals and address labels or some decor for your reception space, you’ll find a great range of products to suit all budgets including table numbers, table plans, confetti, signs, place name cards and cake toppers. They also stock organza bags and cute boxes if you’re looking to spruce up your favours as well as car ribbons and other DIY goodies! If you love decor, this shop should defo be on your hit list! Favour Lane has absolutely everything you could possibly need to make your wedding epic from decor and gifts to DIY supplies – they even stock hen party accessories. They’ve some amazing collections to make shopping even easier for you including shabby chic, vintage, glamorous gold and silver or you can shop items individually. Pick up everything from favours, ribbon, bunting and place settings to signs, confetti, guest books and balloons. If you love a little glitz, Wedding Belles Bridal Accessories & Gifts will be right up your street. This online store has lots of pretty pieces that will complete your bridal look including hair accessories, bridal belts, clutch bags, jewellery and garters. They also have some seriously sweet gift ideas – you can pick up countdown signs, bridal party mugs, champagne glasses and hipflasks as well as some great decor buys. They also have a fab range of bridal brollies if you’re worried about rain making an appearance! If you’re on the hunt for bridal accessories and gifts, The Lovely Little Label is a treasure trove of amazing finds. They specialise in bridal jewellery and accessories stocking everything from stunning vintage inspired headpieces and combs to gorgeous earrings, bracelets and garters and have a fab selection of wedding umbrellas. 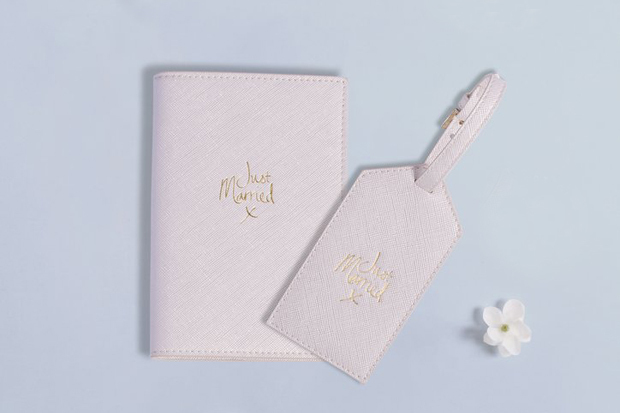 They’ve also got some amazing gift ideas for brides and maids including beautiful bridal pouches, slippers and robes as well as Just Married passport covers and luggage tags! If you’re after beautiful personalised pieces, be sure to pop by River Lane Memories. They specialise in bespoke wedding signs and keepsakes that will really add that personal touch to your celebrations. They use laser technology to create a range of personalised signs from cute flower girl and page boy ‘Here Comes the Bride’ style signs to table markers, and signs for your dancing shoes basket or to announce your hashtag. They also do adorable security badges for page boys, personalised wooden ring boxes and cute tags. They love creating custom one off pieces too so if you’ve an idea, be sure to give them a shout! WowWee.ie have been providing stylish couples with all manner of gorgeous gifts, wedding decor and bridal robes for the past 15 years – all with the wowwee factor! 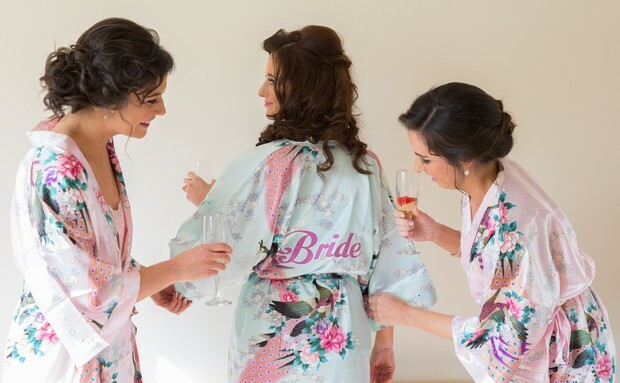 They have their own range of personalised bridal robes in a gorgeous satin floral print as well as a cosy towelling version. They stock hoodies, personalised ring cushions, garters, bridal dolls and hen party essentials such as tees, sashes and totes too. They also have a fab selection of gifts for the bridal party and the happy couple including mugs, glasses, cushions, personalised hankies and ornaments. If you’re looking to deck the bride squad out in personalised goodies for the Big morning, pop over to Simply Personalised Embroidery. They specialise in beautifully embroidered gifts and clothing that can be personalised to perfection including robes (fluffy, light cotton, towelling, waffle – they even do kids ones too!). Robes are made to order so you can have anything you like embroidered on them! And if you’re shopping for gifts, you can also pick up personalised hoodies and slippers, tote bags, hankies, socks for the guys and rag-dolls and teddies for the little ones.